TS Rc 330,TS/Telangana Rc 330 Dated 25.08.2015,Vidhya Volunteers Recruitment Guidelines, Academic Instructors Appointment Rules,Academic Instructors Appointment Guidelines Rc Go. Director of School Education Telangana Hyderabad has issued Rc 330 dated 25.08.2015. 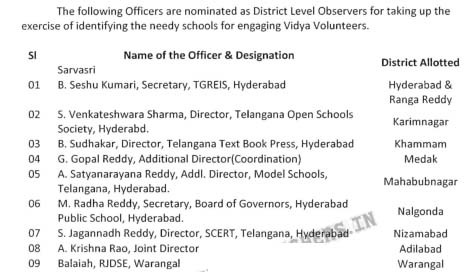 Engaging Vidhya Volunteers/Academic Instructors in state Observers appointment Guidelines Rc 330 are issued for Academic Instructors or Vidhya Volunteers are required in the TS schools. Further,they are requested to verify the requirement of additional text books with reference to the latest enrollment and text books already supplied to the district and verify correctness.